Ryan Mrozowski has double vision. Of course we all do, give or take the occasional accident victim or pirate, but most of the time we treat our vision as a static whole and overlook the dynamic fusion of separate views that makes it possible. But the same miraculous paradox — the state that’s really a relationship, the two somehow acting as one — powers intimacy, communication, and consciousness itself, and in his first solo show at On Stellar Rays, Mrozowski illuminates all these mystic doubles at once with an elegantly direct attack on their basic mechanism. To begin with, he opens an illustrated encyclopedia and draws birds on bits of mylar, taking care to forget their individual names. He shuffles through these little drawings quickly till he finds a combination he likes, projects that combination onto larger paper, and draws the whole thing over again, just as quickly, with black oil stick. 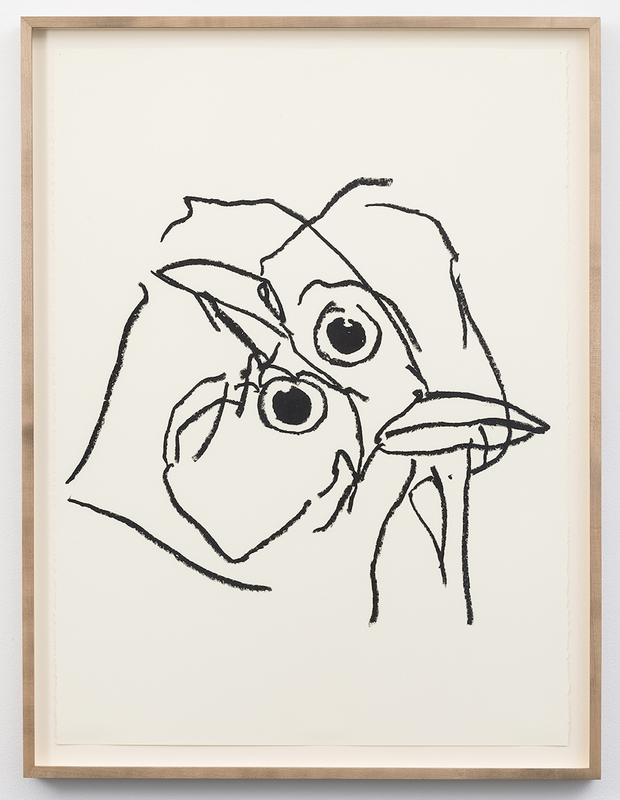 “Untitled (Bird Drawing)” (2015), the piece that opens the show, presents two pointy, slightly hooked black beaks facing right, with two round eyes, each made to shine by a carefully placed white notch, stacked vertically behind them. The drawing is perfectly clear — a slightly hasty waver gives Mrozowski’s line life without impairing its lucidity. But if you tried to count the birds, you’d quickly find yourself in an infinitely graded shadow world. How can we be sure that what looks like two isn’t really one bird sliced through and splayed open, or even a tight huddle of three, as collectively singular as the Simurgh in Farid ud-Din’s “Conference of the Birds”? And what about the other “Untitled (Bird Drawing)” (2015), just inside the gallery’s main room, which, like a distorted reflection of the first, shows our birds glued in a murderous embrace? 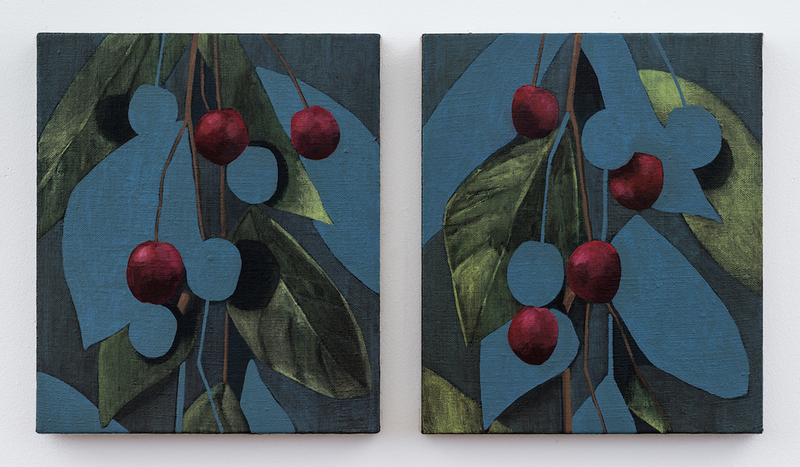 “Pair (Yellow Flowers),” “Pair (Cherries),” and “Pair (Indeterminate fruit),” all acrylic on linen diptychs, work like stereoscopes: in each case, two not-quite-identical versions of the same lush, close-to-the-surface hothouse scene are set side by side. In “Pair (Yellow Flowers),” for example, pointed leaves hang against a background of dense green shadow, and three spindly yellow blossoms are tacked on top with all the brave despair of a down-at-the-heels gigolo affixing a boutonniere. 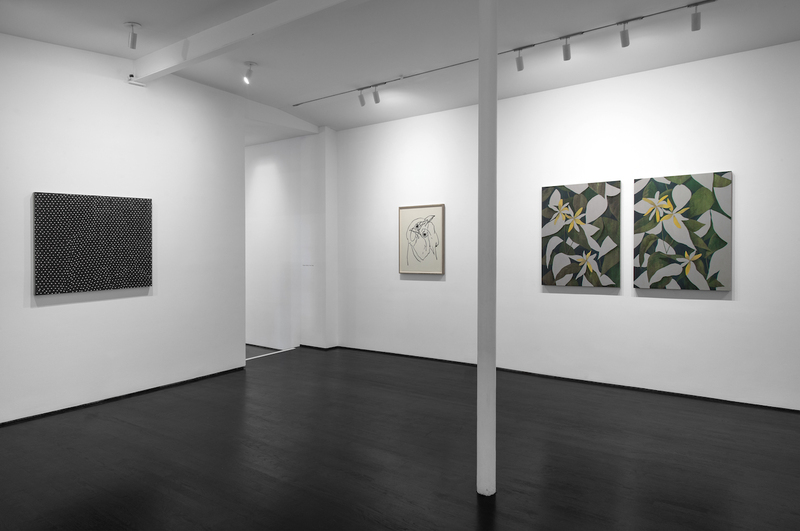 And then, as if to emphasize the relational quality of meaning — the fact that nothing means anything except by virtue of its position relative to something else — Mrozowski paints over every alternate leaf or petal, more or less, in a flat, pale gray. What really proves the point is that you can stare at one of these diptychs for quite some time (or at least I could) without noticing that the right- and left-hand erasures are complements: what’s gray to one side is green to the other. 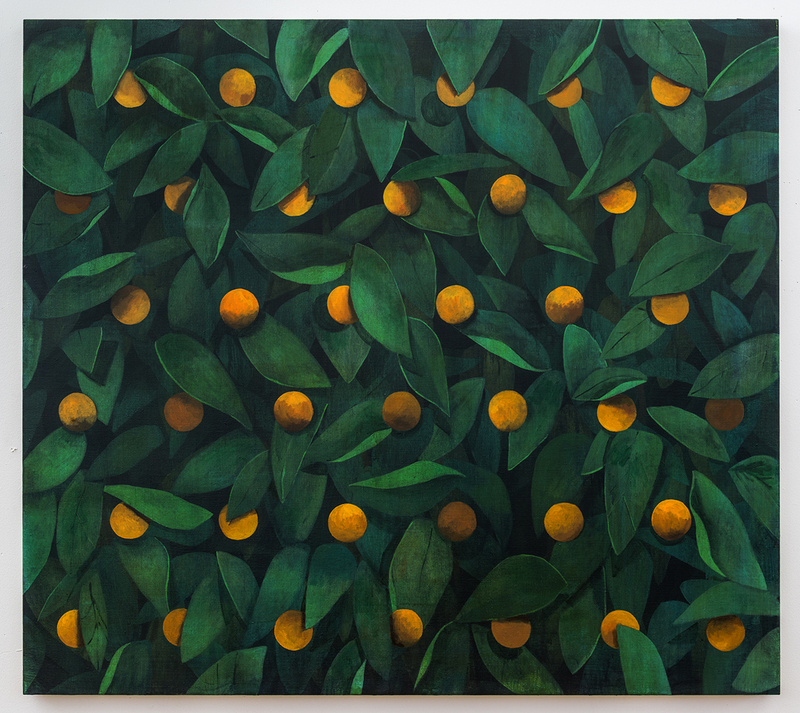 That said, I spent most of my time standing in front of “Untitled (Orange)” (2015), a curtain of fully modeled but evenly-spaced and carefully neutral oranges — bright orange spheres without texture or stem — floating against a wall of broad, almond-shaped leaves that similarly curl, bend, overlap, point every which way down, and shadow or are shadowed but don’t clearly connect to anything or display any of the random imperfections that would mark them as having been grown, not painted. Ryan Mrozowski, “Untitled (Orange)” (2015), acrylic on linen, 50 x 56 in. “On the surface, of course,” I was telling myself, “they’re oranges — but what are they, really?” My first thought was pixels, which would make the piece a computer-age trompe l’oeil in which a mindlessly repetitive algorithm creates a simulation of natural growth. But the warmth and care lavished on each orange and leaf wouldn’t quite square with this reading, even apart from the fact that pixels aren’t round. Oranges were formerly a luxury item — think of that famous museum down the block from the Louvre — and so for just a moment I felt reminded of Damien Hirst’s dot paintings. But the distinguishing feature of those nefarious dots is their interchangeability: they roll off the presses like money, and their division among particular frames, or even among particular boardrooms and homes, seems almost incidental. Mrozowski’s pattern, however, is fully new in every separate canvas. The large painting has them at sixes and sevens, and a smaller one also on view shows two bends sinister of three fruits each, as if to advertise a double pawnshop; in others, the artist has arranged them in generously bordered grids or like the numbers on dice. So this isn’t an infinitely fungible pattern cynically mimicking life, after all, but its opposite — a humane performance promising the world only while the curtain’s up. More to the point, Mrozowski has a sense of humor, so there’s nothing cold about any of this precision. The birds perch jauntily at attention, the “indeterminate fruit” snickers and nudges your shoulder, and the oranges have all the innocent glee of a magician who’s seen better days but remains as fascinated as ever with his own ball-and-cup gag. “After all,” I said to myself, “whatever may be laid over it — late capitalist malaise, the strange, international commodification of painting, the unbearable weight of art history — the trick itself never changes. We’re all just trying to communicate with the means we find at hand.” My eye fell on one bright sphere in particular (second from the left, third row down) and suddenly I knew what it reminded me of: a clown nose. 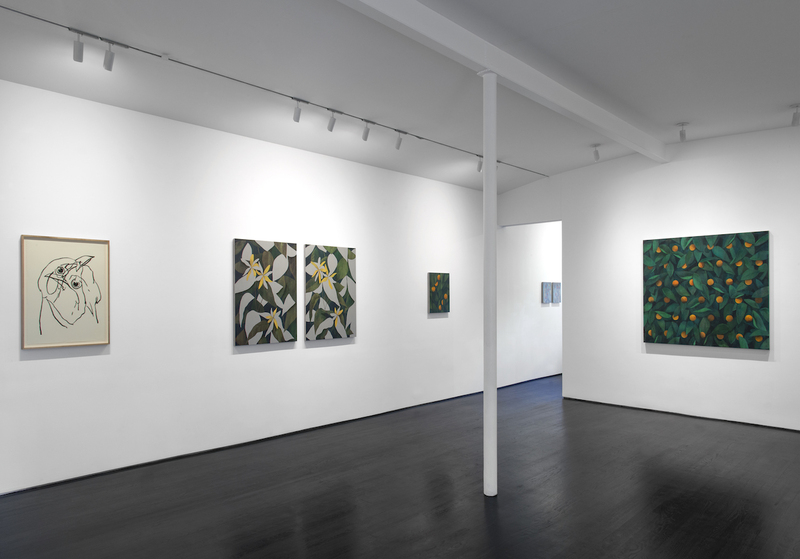 Ryan Mrozowski’s exhibition Open, Other, End continues at On Stellar Rays (1 Rivington Street, Lower East Side, Manhattan) through December 13.